This year is the 169th anniversary of Edgar Allan Poe's death and while many of his works have been interpreted over the years in various mediums, it is perhaps his narrative poem The Raven that many are familiar with. First published in 1845, Poe's poem has left an impression on many throughout the world and now The Raven will fly once more. Director Damian Draven's interpretation aims to peel back the skin in a word for word immersion of Edgar Allan Poe's poetic masterpiece. His hope is to create the go to movie for Poe fans and a modern audience. 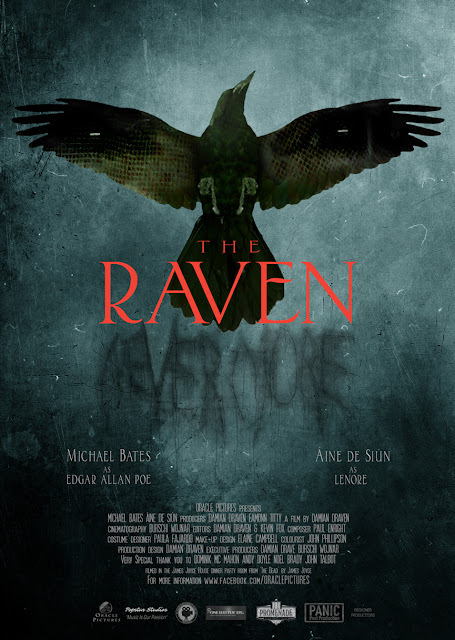 The Raven tells the story of a poet longing for his lost love. A tragic role that Poe knew he would soon be playing himself. Poe is projecting ahead the loss of his wife Virginia. A writer who is trying to forget and desperate to repress or deny or somehow let go of the terrible weight of this loss and yet he asks that question at the end; 'When will I see my lost love Lenore? Quote the Raven 'Nevermore'. The poem is a kind of rehearsal, for his own bereavement. THE RAVEN will screen at the Poe Film Festival in Virginia and the Spooky Empire festival in Orlando.